Born: 25th September 1890, Great Barton, Suffolk. 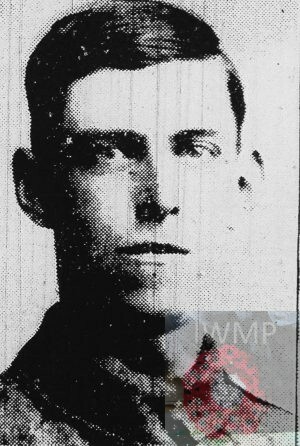 Died: 16th September 1916; age 26; KiA- in the great advance – during the Battle of Flers- Courcelette. Enlistment in the Royal Navy: Location: Chatham; Date: 9th August 1912; Occupation: Footman. Height: 5ft 6 ins, sallow complexion, grey eyes & dark brown hair. Tattoo – Heart on left arm. Blenheim – 9th August 1912 – 30th September 1913. Egmont II – 1st October 1913 – 16th February 1914 – 20 days detention – drunk. Egmont II – 27th October 1914 – 31st March 1914. Blenheim – 10th April 1914 – 10th May 1914. Enlistment Location: Ipswich – 1914. Served at the Battle of Loos. Rank: Private; Service Number: 15418. Relatives Notified & Address: Son of Charles Bond, of 124, Camden Road, Ipswich & the late Alice Bond; husband of Elizabeth May Robinson (formerly Bond), of Earls Green, Bacton, Suffolk. 1891 by the fen, Roydon, Norfolk. Charles was a year old and living with his parents. Charles David Bond, 30, a Gardener, born Roydon, Norfolk. Alice Agnes Bond (nee Goose), 31, born Tasburgh, Norfolk. 1901 Fairfield House, North Entrance, Saxmundham, Suffolk. Charles was 11 years old and living with his parents & brother. Charles, 40, a Gardener & Caretaker. James Bertram Bond, 7, born Bramford, Suffolk. 1911 Copenhagen Cottage, Bramford, Suffolk. Charles was 21 years old, a Footman – Domestic. He was living with his parents. Charles, 42, a Gardener – Domestic. In 1915, Ipswich, Charles married Elizabeth May Jacobs, born January 1890, Ipswich. Soldiers’ Effects to Elizabeth M. Bond – widow. Charles is also remembered on the headstone of his parents, brother & sister-in-law, at Ipswich Old Cemetery, Ipswich.